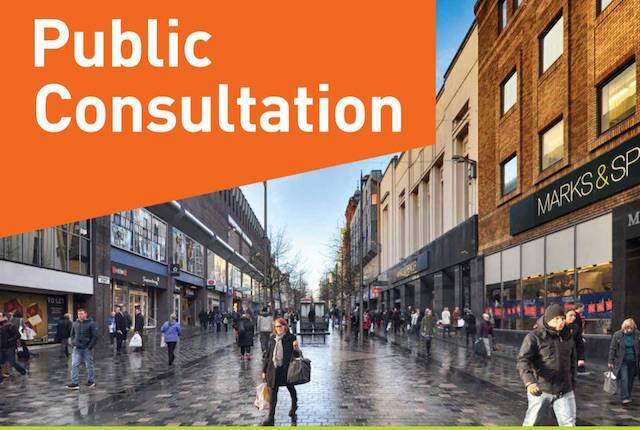 After many months of public input and hard work, Glasgow City Council has published the draft Sauchiehall and Garnethill District Regeneration Framework for public consultation. The Sauchiehall and Garnethill District Regeneration Framework is the result of engagement with residents, businesses and organisations in the District sharing their time, knowledge and ideas about what they like about this part of the city centre and how it could be in the future. This next stage is formal public consultation on the draft, the aim of which is to make sure the draft document sets the right agenda for change in the District. There has already been positive comment on our Twitter feed and in the media about the draft Regeneration Framework – for example, in The Herald, The Guardian and STV Glasgow’s The Riverside Show (11 minutes in). But we need to know what you think too. Why was this draft Regeneration Framework developed? The Council believes that placing people at the centre of city planning, policy and design decisions will benefit its people, their health, the environment and the city’s overall economy. Glasgow City Centre Strategy and Action Plan was the first important step towards creating a more walkable, connected city centre. At the heart of this urban vision is the establishment of nine new ‘Districts’ and the creation of a Regeneration Framework for each one. Sauchiehall and Garnethill District is the first district to benefit from this people-oriented approach. Using international knowledge of how to create people friendly environments, the consultant team led by Gehl Architects and Nick Wright Planning conducted extensive data collection and analysis, surveys and widespread stakeholder engagement which gave local people chances to get involved in the development of this draft Framework. A range of face-to-face and online engagement activities, including this dedicated website and social media channels, helped to understand key issues and identify opportunities and broker new relationships. What’s in the draft Regeneration Framework? It has four strategic themes and puts forward over 80 actions to build on the assets in the District by creating short, medium and long term improvements. Delivery of these actions over the next decade or so will depend on funding availability and cost-benefit analysis. A prioritised list of key projects will be identified through this public consultation. What are the four strategic themes? 1. A living district: to develop a strong and safe mixed-use neighbourhood that will provide access to local, everyday services, which in turn will help facilitate healthier and more active lifestyles. By developing attractive, better connected spaces that are designed to encourage public use, the Framework hopes to make the district overall a better place for those who live, work, or visit there. 2. Local distinctiveness: to improve the public space across the district, and better capitalise on its cultural assets. 3. Connected and mobile: with a focus on enhancing physical connections within and outwith the district, with pedestrian priority over all other modes of transport. 4. A vibrant district: supporting opportunities to encourage independent and local business development, with affordable housing and leisure activity and greater availability of social and economic options for residents and visitors. The draft Framework also contains a Public Space Plan that puts forward a number of project proposals that would help create more green and quality spaces for pedestrians and cyclists in different parts of the District. How can I see and comment on the draft Regeneration Framework? When does the public consultation start and finish? The public consultation will take place from 20 November 2015 to 15 January 2016. After the consultation closes on 15 January 2016, the draft document will be revised and an action plan developed. A final version of the Regeneration Framework will then be brought back to the Council’s Executive Committee for approval. Once approved, the Framework will become Supplementary Guidance to the City Development Plan, meaning that it will be a ‘material consideration’ in determining planning applications in the District. Who do I contact if I want to ask a question about the draft Regeneration Framework? Further information is available on the proposed Traffic Regulation Order to introduce this proposal can be found on the Council website at www.glasgow.gov.uk/proposedtro. Public consultation on the Traffic Regulation Order took place up until on 30 November 2015.